When The Venetia Fair set out to create their Every Sick Disgusting Though We've Got In Our Brain album, they took things to Kickstarter. One of the perks of the project was that if you donated a certain amount of money, you could pick a cover song for The Venetia Fair to record for an upcoming EP. Starting today, you can get your grubby little hands on that kickass EP, The Venetia Fair... Basically Just Does Karaoke. I'm a sucker for a good cover song and I'm also a fan of The Venetia Fair, so Karaoke is definitely in my wheelhouse. The band's fans didn't do them any favors by choosing "Bohemian Rhapsody" and "Come On Eileen," two songs that are probably among the hardest songs to perform, both musically and especially vocally. But not only are The Venetia Fair up to the task, they put their own spin on these tunes and breathe new life into these classics. They also offer up their own takes on "Rock Lobster" and Green Day's "Jesus Of Suburbia," as well as songs from Coheed And Cambria and The Blood Brothers. Looking for a last-minute Christmas present for that certain someone special? Or maybe you will need something to blast when you've overdosed on family time during the holidays? Then you definitely need to check out The Venetia Fair... Basically Just Does Karaoke. 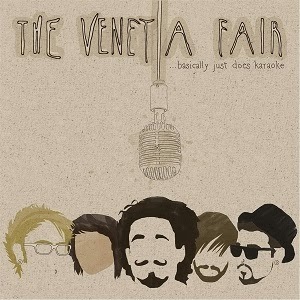 The Venetia Fair... Basically Just Does Karaoke is available on the band's Bandcamp page.